↑ 1.0 1.1 "Pacific Ocean". Britannica Concise. 2008: Encyclopædia Britannica, Inc.
↑ "Area of Earth's Land Surface", The Physics Factbook. Retrieved 9 June 2013. ↑ Nuttall, Mark (2005). Encyclopedia of the Arctic: A-F. Routledge. p. 1461. ISBN 978-1-57958-436-8. สืบค้นเมื่อ 10 June 2013. ↑ "Plate Tectonics", Bucknell University. Retrieved 9 June 2013. ↑ Young, Greg (2009). Plate Tectonics. Capstone. pp. 9–. ISBN 978-0-7565-4232-0. สืบค้นเมื่อ 9 June 2013. ↑ International Hydrographic Organization (1953). Limits of Oceans and Seas. International Hydrographic Organization. สืบค้นเมื่อ 9 June 2013. ↑ Agno, Lydia (1998). Basic Geography. Goodwill Trading Co., Inc. pp. 25–. ISBN 978-971-11-0165-7. สืบค้นเมื่อ 9 June 2013. ↑ Shirley Rousseau Murphy (1979). The Ring of Fire. Avon. ISBN 978-0-380-47191-1. ↑ Bryant, Edward (2008). Tsunami: The Underrated Hazard. Springer. pp. 26–. ISBN 978-3-540-74274-6. สืบค้นเมื่อ 9 June 2013. ↑ "The Map That Named America". www.loc.gov. สืบค้นเมื่อ 3 December 2014. ↑ K, Harsh (19 March 2017). "This ocean has most of the islands in the world". Mysticalroads. Archived from the original on 2 August 2017. สืบค้นเมื่อ 6 April 2017. ↑ Ishihara, Masahide; Hoshino, Eiichi; Fujita, Yoko (2016). Self-determinable Development of Small Islands (in อังกฤษ). Springer. p. 180. ISBN 9789811001321. ↑ United States. National Oceanic and Atmospheric Administration; Western Pacific Regional Fishery Management Council (2009). Toward an Ecosystem Approach for the Western Pacific Region: from Species-based Fishery Management Plans to Place-based Fishery Ecosystem Plans: Environmental Impact Statement (in อังกฤษ). Evanston, IL: Northwestern University. p. 60. ↑ Academic American encyclopedia. Grolier Incorporated. 1997. p. 8. ISBN 978-0-7172-2068-7. สืบค้นเมื่อ 12 June 2013. ↑ Lal, Brij Vilash; Fortune, Kate (2000). The Pacific Islands: An Encyclopedia. University of Hawaii Press. pp. 63–. ISBN 978-0-8248-2265-1. สืบค้นเมื่อ 14 June 2013. ↑ West, Barbara A. (2009). Encyclopedia of the Peoples of Asia and Oceania. Infobase Publishing. pp. 521–. ISBN 978-1-4381-1913-7. สืบค้นเมื่อ 14 June 2013. ↑ Dunford, Betty; Ridgell, Reilly (1996). 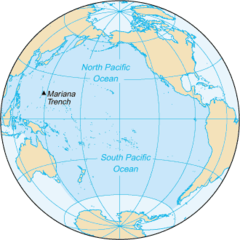 Pacific Neighbors: The Islands of Micronesia, Melanesia, and Polynesia. Bess Press. pp. 125–. ISBN 978-1-57306-022-6. สืบค้นเมื่อ 14 June 2013. ↑ Gillespie, Rosemary G.; Clague, David A. (2009). Encyclopedia of Islands. University of California Press. p. 706. ISBN 978-0-520-25649-1. สืบค้นเมื่อ 12 June 2013. ↑ "PWLF.org – The Pacific WildLife Foundation – The Pacific Ocean". Archived from the original on 21 April 2012. สืบค้นเมื่อ 23 August 2013. ↑ Mongillo, John F. (2000). Encyclopedia of Environmental Science. University Rochester Press. pp. 255–. ISBN 978-1-57356-147-1. สืบค้นเมื่อ 9 June 2013. ↑ "Pacific Ocean: Salinity", Encyclopædia Britannica. Retrieved 9 June 2013. ↑ "Wind Driven Surface Currents: Equatorial Currents Background", Ocean Motion. Retrieved 9 June 2013. ↑ "Kuroshio", Encyclopædia Britannica. Retrieved 9 June 2013. Nunn, Patrick D. (1998). 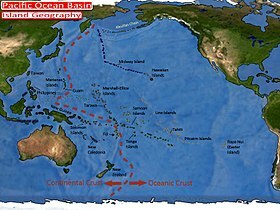 Pacific Island Landscapes: Landscape and Geological Development of Southwest Pacific Islands, Especially Fiji, Samoa and Tonga. ISBN 978-982-02-0129-3. Soule, Gardner (1970). The Greatest Depths: Probing the Seas to 20,000 ฟุต (6,100 เมตร) and Below. Philadelphia: Macrae Smith. ISBN 0-8255-8350-0. Davidson, James Wightman. "Problems of Pacific history." Journal of Pacific History 1#1 (1966) : 5–21.